But the hubby said, after seeing this one, "Maybe we should start learning how to mount these and frame 'em." The line of poetry is from "Spring Script" by (I know I'm going to mangle this as I have not the Pinyin) Moong Hou Rang, the last line of it is just "flower petals know how much." And then I tried bamboo again after seeing groves and groves and groves of it at the SD zoo.... and realized that it really is that crowded sometimes. The colors are lovely and soft yet striking. I love the lines made by the branches. The bamboo is very convincing. It also has a peaceful quality. Excellent effort! Very nice! That dark bamboo really looks like it has depth, on the page. And yeah, I could see them looking quite nice on the wall. Those are beautiful. They should definitely be saved/framed! I agree,these are so beautiful. My first thought was that the bird was much better. It doesn't look like it's defying physics to fly. 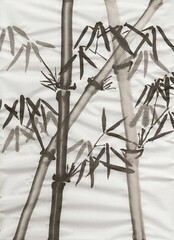 My second thought, upon seeing the bamboo, was I really like this! Yay for progress!! *laughs* Yes. It is not an overly fat sparrow. Whew. Yeah! That address will work just fine. If you have paypal, I could send you the email to send paypal money to, but if not, we'll figure something out. Those are so pretty! I especially like the bamboo. Are they painted on fabric? They're painted on something called "rice paper" but isn't actually made of rice at all. It's a non-sized long-fiber paper. "Double Shuen" is one designation of the weight of the paper I'm actually using, it's absorbent, which is why the water marks around the petals. It requires a lot of control of the amount of water I have on the brush at any time, and it good practice for actually painting on fabric, which I want to do eventually. These push all my buttons! 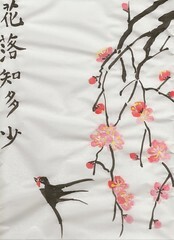 I really, really like cherry blossoms and bamboo, and I have been on the lookout for some themed art to go in my new house. This is exactly the sort of thing that would catch my eye - simple, elegant, and pretty, all without being pretentious. How beautiful. The bamboo one is definitely something I'd love to have on my wall.